Update on 20th March 2019: NTA has Released JEE (MAIN) 2019 Admit Card. Download the Hall Ticket from below links. For details Read article carefully. It had been announced through the Information Bulletin of JEE (Main) April 2019 that this Examination will be conducted between 07.04.2019 and 20.04.2019. Now, Election Commission of India has declared the dates for General Election on 11th, 18th, 23rd and 29th April 2019 as well as on 6th, 12th and 19th May 2019. The individual Candidates can see their exact date and shift from their respective Admit Cards, which would be uploaded in the Examination Portal (www.jeemain.nic.in) on 20.03.2019. National Testing Agency (NTA) is going to release JEE Main April 2019 admit card on 17th Dec 2018. 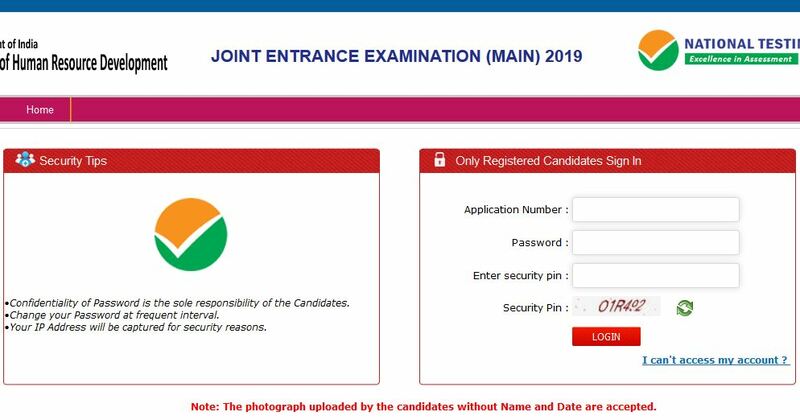 The JEE MAIN Admit Card/Hall Ticket 2019 will be released in Online mode only. So all candidates who appeared for January session of JEE Main 2019 first attempt exam which is scheduled to be conducted from 8th Jan 2019 to 12th Jan 2019 can download the JEE MAIN 2019 Hall Ticket from schools360.in and official Website i.e, jeemain.nic.in. The JEE Main 2019 Hall Tickets can be downloaded using the login credentials. Admit Card must be produced as a mandatory document for entering the exam hall and no candidate would be allowed to appear for JEE Main without the admit card. The Results of JEE MAIN 2019 are expected on or after 31st Jan 2019. Earlier this year in October 2018, The NTA opened registrations for the JEE Main 2019 exam. From this year, JEE will be conducted twice a year by NTA. The exam will be held in two shifts as 9:30 am to 12:30 pm and 2:30 pm to 5:30 pm. Here in Schools360.in we provide exact way how to Download JEE Main 2019 Admit Card. JEE (Main) April-2019 7th April 2019 8th, 9th, 10th and 12th April 2019. Look for Green coloured button Saying JEE MAIN Admit Card Download. Login to your account using credentials which you recorded while registration. Download the Admit Card and Take a Printout for Further use. Look for Exam Date and Time Details on Admit Card. a passport size photograph identical to the one uploaded while filling up the application form.